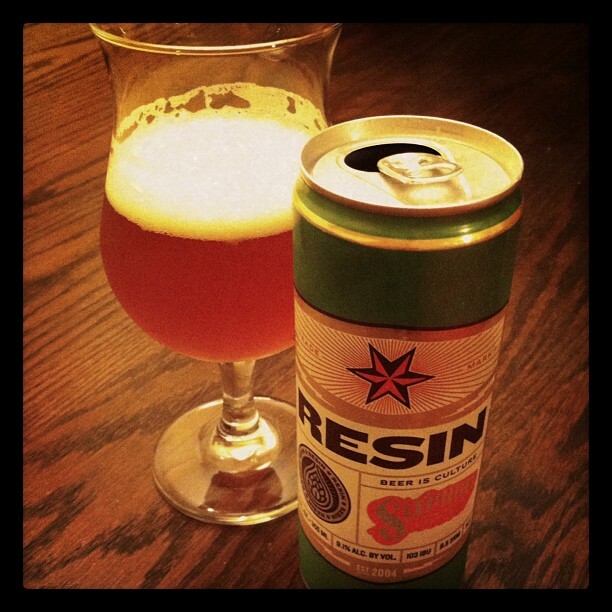 Resin is an Imperial IPA made by Sixpoint Brewery, and it’s all about a celebration of the hop. Founded in 2004, Sixpoint was the brainchild of college classmates Shane Welch and Andrew Bronstein. Shane was the homebrewer of the pair, and Andrew could get the cash needed to start up the brewery in Brooklyn, New York. The brewery only kegged beer and filled growlers until June 2011, when they began distributing a core year-round line, of which Resin is part of. Sixpoint cans all of their beers, and have since began introducing seasonal offerings. Resin comes in at 9.1% ABV (alcohol by volume) and a big time 103 IBUs (International Bitterness Units). Resin from hop cones are what provide beer with a hoppy flavor and bitterness, and this is achieved by heating the hop cones, releasing the resins into a dissolvable form into beer. Resin poured out a large head, lasting and soapy in texture. 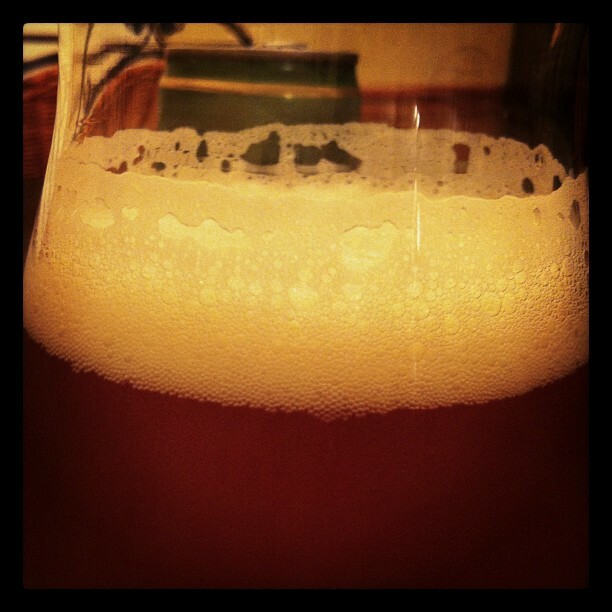 The beer was orange with some darker amber hues close to the stark white head, with no particles or sediment present. The body was clear, and this looked very much like a classic American Imperial IPA. The lacing was good, starting out strong but fading the more I sampled. On the nose, the classic IPA theme continued; there were big, juicy hops up front, with grapefruit and various tropical fruits, and an underlying note of peach. But there’s a two-part story to the hops here; there’s also a strong pine aroma, coupled with, well… resin, just like the name of the beer says. It’s sappy and almost overtakes your nose, in a good way. Then there’s the attempt at balance, which offers sweetness, caramel, and bread-like scents. On some big IPAs like this one, you can smell the bitterness, but Resin falls more on the sweet end. There’s also a small whiff of alcohol present. The taste is a total WOW moment, at least for me. I tend to like sweeter IPAs, and this one definitely has some sweetness cooking in the kitchen — but first, up front, there’s a big dank pine note, sappy and resinous. Sixpoint selected a perfect name for this beer. There’s also a bit of mint from the hop sharpness, and it is followed by a sweet middle; some caramel, grain, and bread. Then we hit the finish…up until this point, Resin had been fairly sweet, but this one shows the full tooth of 103 IBUs, hitting the tastebuds like a brick thud, coating the mouth with a heavy bitterness. There’s noticeable alcohol here, but it pairs perfectly with the bitterness and leftover sweet taste. Mouthfeel was medium-bodied, fairly gritty and foamy. Resin is a most impressive beer, in the fact that it is balanced but not balanced. Balanced in terms that it manages sweetness versus bitterness expertly — not balanced in terms of hops vs malt. This is a total hop explosion, but it presents sweet hops against bitter, alcoholic hops. And it WINS. The best part about this brew is that it is year-round. Some breweries make a beer like this and specify it limited release. I would kill to get this distributed in my neck of the woods; I’d buy it by the case! 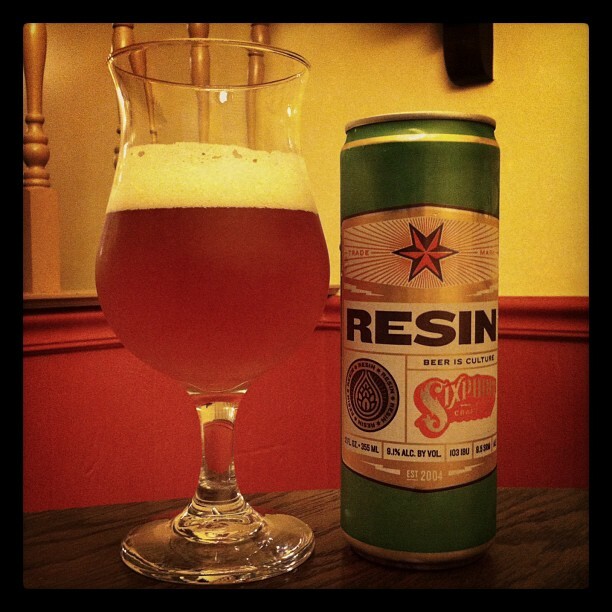 Sixpoint Resin Imperial IPA, 94 points. Price: $2.75 US for one twelve ounce can. Great post Derrick. I fancy myself a career beer taster as well. No real credentials of course besides an enthusiastic love for quality beer. I have recently been on an IPA binge. 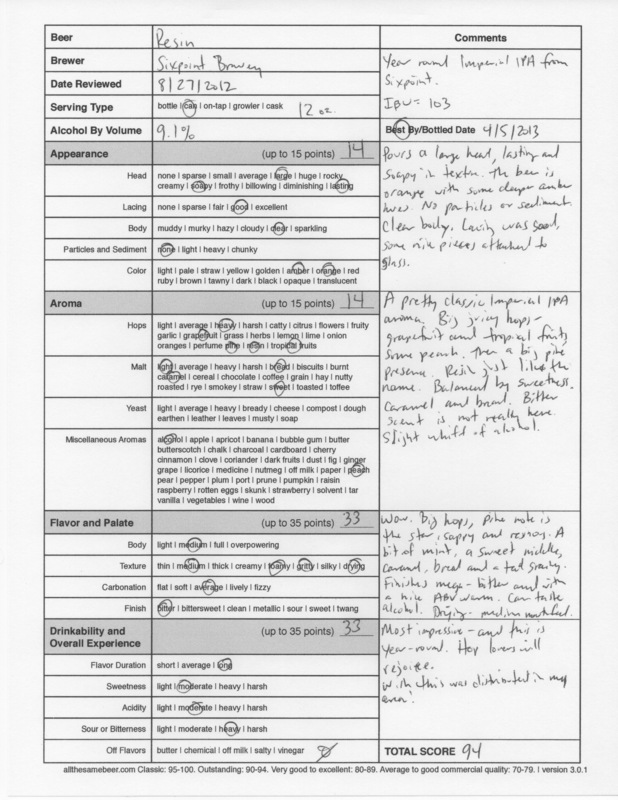 My latest experiment finds me comparing IPAs to my current favorite- Sierra Nevada’s Hoptimum. Have you had the pleasure of trying it? You said you prefer the sweeter side of IPAs and Hoptimum is a bit on the dry side but I was curious to know how you feel it compares to Resin. Thanks. I gave it 97 points, which puts it as a classic beer on my rating scale. The interesting thing about Hoptimum is that this is the first year it has been really good. When it was first released in 2011, it simply wasn’t a good hoppy beer; it was much more malty than I think even Sierra Nevada anticipated. They definitely changed the recipe for this year’s batch. I went through three 4-packs of it this year, and my bottle shop still has a couple of cases, but I’m leery of getting more because it’s probably not fresh anymore. As for how it compares to Resin, Hoptimum had some delightful tropical fruit flavors, much like a fruit juice concentrate. Resin was mostly all about the pine. Hoptimum seemed to have a more complex hop profile to my palate. I highly recommend you try Terrapin Hopzilla and Bell’s Hopslam if you’re really into the Imperial IPAs. Hopslam is easily my favorite Imperial IPA of all time. I think you’d be blown away by it.